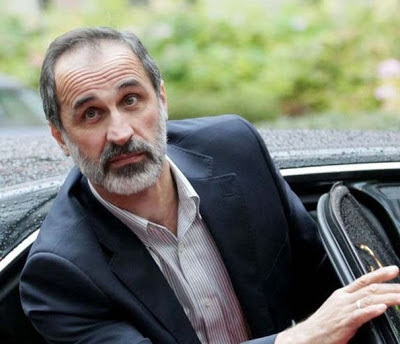 Moaz al-Khatib is today facing calls to step down as head of the Syrian National Coalition of Revolutionary and Opposition Forces over his “unilateral offer” to negotiate with representatives of President Bashar al-Assad. The resignation calls come after the Syrian National Council (SNC), a key component of the National Coalition, openly challenged Khatib’s conditional proposal. “Speaking in a personal capacity does not change the fact Khatib heads the National Coalition,” says Anas al-Abdah, a member of the SNC and chairman of the Movement for Justice and Development in Syria. He tells today’s edition of Saudi Arabia’s leading daily Asharq Alawsat, “[Khatib] should have resigned before broaching such a sensitive issue. As head of the National Coalition, he should have consulted its members first. A third reaction comes from Obeida Faris, head of the Arab Foundation for Development and Citizenship (AFDC). He tells the paper: “Syrians sacrificed over 60,000 martyrs, more than two million refugees and exiles as well as tens of thousands of detainees. This was not to win a loaf of bread or renew passports. “Passports were denied to tens of thousands of Syrians for several decades. But that didn’t drive them to sit down with a bloodstained regime that committed more crimes than any other serial killer in history. Faris was specifically referring to two provisions in the agreement that founded the National Coalition in Doha last November. Sheikh al-Khatib is neither ignorant nor naïve, says Atwan. He only aired his initiative after taking stock of information and facts gathered at two international conferences he attended this month. They are the January 9-10 meeting hosted by the Foreign and Commonwealth Office to galvanize international support for a Syrian-led transition to a stable democratic country and the January 28 “Friends of Syria” conference in Paris. 1. The definitive rejection by the West -- chiefly the United States – of the idea of arming the Free Syrian Army and other rebel groups coupled with an explicit warning to the Gulf States not to fund or arm the rebels. 3. The Syria crisis stagnating after the regime’s failure to overcome the armed opposition and the latter’s inability to bring down the regime by force. 4. A misreading by the opposition’s Arab and other backers of the regime’s resilience and Russia and Iran’s unbounded support of Assad. 5. A rise in the clout of Jihadists on the ground, especially in northern Syria, and their success in recruiting thousands of young Syrians and in offering social welfare services in areas under their control, which is what the Taliban did earlier in Afghanistan. 6. The acquiescence of most Arab countries supportive of the armed opposition that a peaceful transition is the way out of the crisis. The consequence is acceptance of the regime – albeit for a short period – and opening the door of dialogue with it. 7. Mothballing of the Syria file by the Arab League and its foreign ministers. “Sheikh Moaz al-Khatib grasps all that,” Atwan writes. “But, above all, he realizes that the international community has started to address the Syria crisis as an issue of refugees, rather than the cause of a people seeking reform, democratic change and the removal of a dictatorship. “The just-concluded conference in Kuwait of international donors for Syria, where more than a billion dollars were pledged for Syrian refugees, is proof of the new turnaround.